I would probably never have thought of making this if it weren’t for the “Tom’s Big Breakfast” at Lola in Seattle. A happy plateful of eggs, potatoes, peppers and octopus, I found it surprisingly delicious. 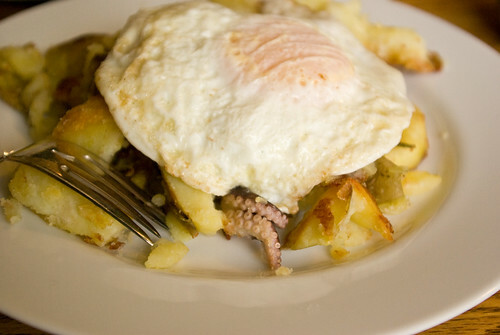 So when we left Gretchen’s the other night with a container of leftover boiled potatoes and steamed baby octopus, I knew that we were going to have octopus hash for breakfast. Since the leftovers were all cooked, all I needed to do was roughly chop the potatoes and toss them into a nonstick pan with a little butter and oil, letting them get good and crusty, then stir in the chopped octopus near the end to heat through. With fried eggs on top and a dab of mayonnaise mixed with habañero sauce, the result was extremely good. And very filling. We gave the octopus heads to the cats. They all thought we were trying to poison them except Mickey, who scarfed everything we gave him. He has excellent taste. i LOVE that octopus shot. beautiful! I am constantly surprised by the fact that the cats are so distrustful of fresh fish. They seem to think that if it doesn’t come in a can, it’s not really fish. That is a different kind of hash and also my kind of hash. The octopus shot looks great. Ditto Lizzie’s comment. 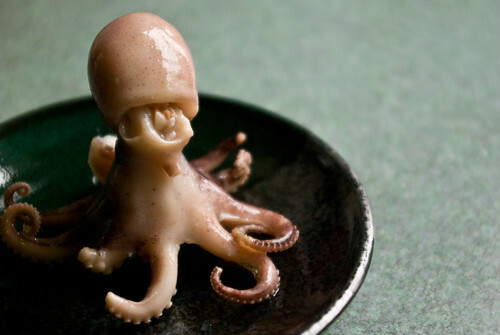 The baby octo is simply stunning. Sneaky little octopus sleeping under a delicious egg.